The latest on Foxconn: never mind. 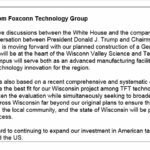 Just days after a Reuters report cast doubt on its future plans in the state, Foxconn Technology Group now says it will build a liquid crystal display manufacturing plant in Racine County. A company statement says that follows talks between President Donald Trump and company CEO Terry Gou. A spokeswoman said there would be no other comment for now. The state agreed to give Foxconn about $4 billion in state and local incentives if it invests $10 billion and creates 13,000 jobs in Wisconsin, under terms of a deal brokered by former Governor Scott Walker.